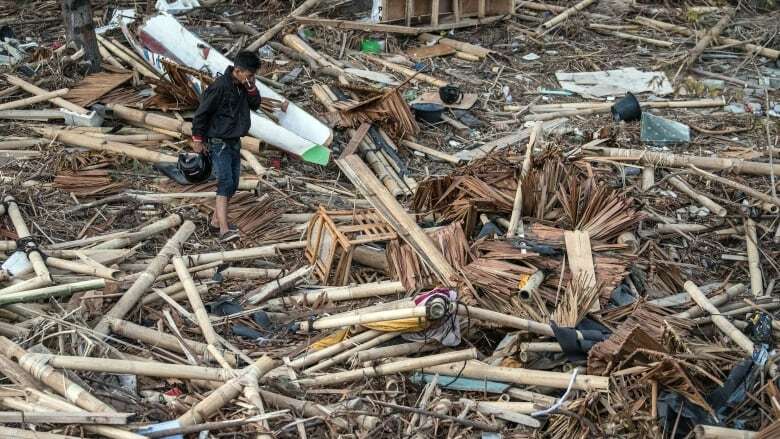 An earthquake and tsunami devastate parts of Indonesia, leaving hundreds of people dead. BBC reporter Rebecca Henschke describes what it is like on the ground where crews have been trying to find bodies in the rubble. First there was an earthquake. Then came the water — a deadly, six-metre tall tsunami that smashed onto land. 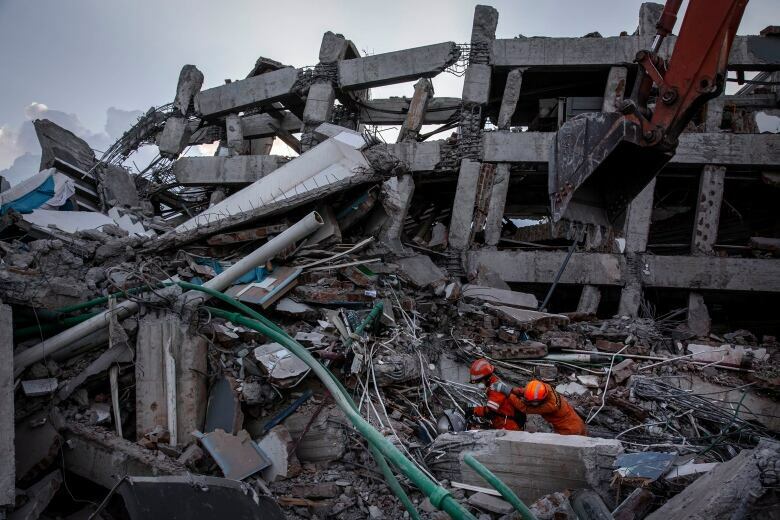 Survivors on the Indonesian island of Sulawesi are dealing with the devastation left behind by the massive 7.5 magnitude earthquake that hit the island on Friday. The official death toll is over 800. But that number is likely to rise over 1,000. Officials have been burying the dead in mass graves and aid workers are in a race against time to rescue survivors from the rubble. 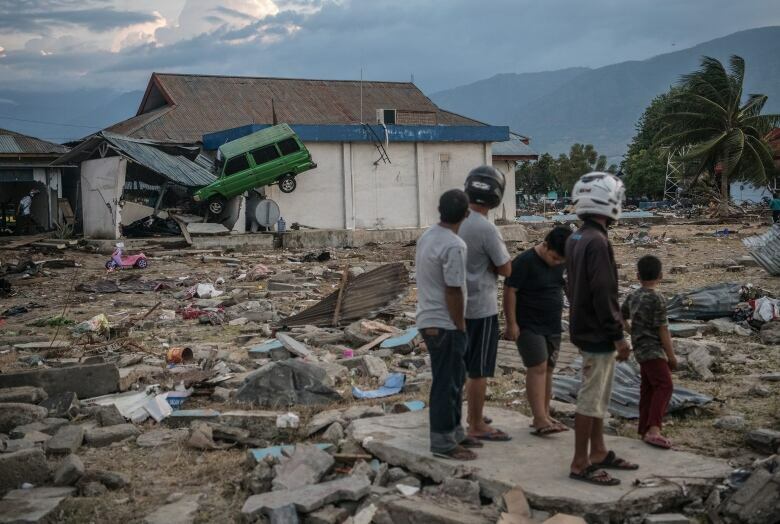 BBC Indonesia editor Rebecca Henschke is on the ground in Palu, which was hit by the tsunami. As It Happens host Carol Off spoke to Henschke about the rescue effort and how people are coping. Rebecca, can you describe what you are able to see in Palu right now? At the moment, I'm standing on one of the main roads heading into the worst effected area. You might hear in the background the sound of heavy trucks coming in. They are carrying excavators into the area. These have been much-needed in the recent days. The people have been digging through the rubble with their bare hands because there hasn't been this heavy building equipment to try to rescue survivors and also to find bodies in the rubble of houses that were destroyed by that powerful quake on Friday and then also washed away by that tsunami that was triggered by it. Do they still believe that they can recover people alive or is this a recovery operation at this point? There have been some rescue attempts in the last 48 hours that have been successful. In one place, in particular, in a hotel, an eight storey hotel, that collapsed. The hotel owner was saying yesterday that he was still hearing people yelling out for help underneath rubble but he wasn't able to reach them. They did manage to rescue more than 24 people though, using their hands, from that hotel. But as the days continue, the hopes of finding people alive, I would have to say, are now slim. You have been able to get to the hospitals to see what is happening there. Tell us what's going on there. We've been to some of the small medical clinics around Palu. The situation today is very bleak. There's no power to the entire town so hospitals and medical clinics can't do complicated operations. They are running out of medical supplies and in most of them, the ones that we have been to, there's rows of bodies in plastic bags. In one that we went to there was a young girl, a five-year-old girl, that they had found alone. She had a broken leg and was crying out in pain on a stretcher, not far from the body bags. She could remember her name but she didn't know where she lived or where her parents were. So the hospital was trying to look after her and will have to try to find some relatives for her. Are people able to get treated? Are there enough beds? Is there enough accommodation for those who need assistance? No, there isn't. Doctors say they are really struggling to treat any of the injured. They are running out of basic medical supplies. They don't have enough medical teams to deal with the injured. The main hospital in Palu was badly damaged in the quake. S,o from the moment that it hit on Friday they were having to set up tents outside that hospital to treat people. Most people are continuing to sleep outside even if they have a house to go to because of these constant aftershocks that we are almost feeling regularly here. People are very frightened and they also being told to sleep out in the open. So injured people are also being treated that way. Is there also aid arriving? Are people getting the supplies they need at this point? People that I've been speaking to say that no they are not receiving the aid that they need. Rescue workers are entering the area. President Joko Widodo has visited. He is promising more food and water aid today. We haven't seen that on the ground where we have been. The local government has set up different points around the city that have sort have become evacuation areas of tent cities, mainly where women and children are staying. And there, there are communal kitchens. People are sharing food. There are places where people can get the water that is available to have a bath. The sense of community spirit here is very strong. People have been offering us free food, water, whatever they have, throughout the day. Hotels are opening their doors freely for people to come in and use what facilities they have. But in terms of an organized aid operation, there's nothing like that here now, and some of the big international aid agencies are struggling still to get into the area because of landslides blocking roads. Some people are trying to get around with ships. We understand that some boats carrying aid will arrive tomorrow that hopefully relieve the situation because desperate people have been looting shops here. So all the small supermarkets here, most of their stock has been emptied out. People are taking matters into their own hands. Written by Katie Geleff and John McGill. Produced by Katie Geleff. Q&A has been edited for length and clarity.